KTM is delighted to announce that motocross icon and overseer of the Red Bull KTM Factory Racing AMA Supercross and Motocross team in the United States, Roger De Coster, will continue to be a part of the massively successful operation in Murrieta, California. 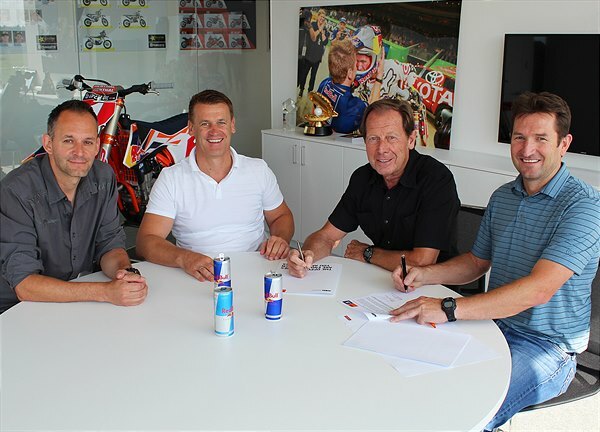 The Belgian has put pen to paper on a multi-year agreement and a new role for the KTM Group. De Coster will be ‘Motorsport Director KTM/Husqvarna North America’ and retain a more strategic and senior position in all of KTM and Husqvarna’s USA racing activities. Ian Harrison has been Roger’s ‘right hand man’ and key collaborator for a number of years – certainly since 2011 when De Coster first came to KTM – and has also renewed his position with the KTM Group to become de facto Team Manager of the Red Bull KTM MX/SX squad and Technical Director of the KTM/Husqvarna efforts in the United States. The De Coster/Harrison link was largely fundamental in the reorganisation of KTM’s sporting arm in high profile Supercross and Motocross circles at the start of the decade. The pair were instrumental in forging a close link with R&D in Mattighofen, Austria and elevating the race team to the position of champions. Ryan Dungey’s signature was key as was development of outstanding talent such as Ken Roczen and Marvin Musquin; KTM went on to toast titles and milestones in every AMA division. Recently, the alliance with Aldon Baker’s training regime only strengthened the KTM Group’s status and ensured the finest resources towards the current and next generations. This entry was posted in Global News, Lifestyle, Moto, Motorsports, Offroad by admin. Bookmark the permalink.